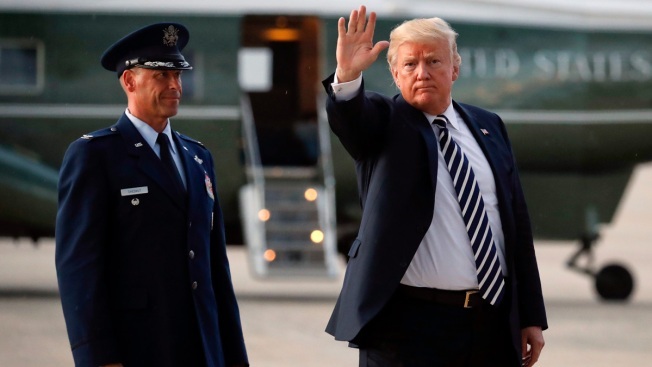 In this Aug. 31, 2018, file photo, President Donald Trump waves to members of the media after arriving on Air Force One at Andrews Air Force Base in Md. Washington Post journalist Bob Woodward's explosive new book, "Fear: Trump in the White House," reveals multiple instances in which top aides went behind President Donald Trump's back to undermine his decisions. The president's trusted aides and lawyers doubted his ability to say the right things and make appropriate decisions, according to examples published by The Washington Post on Tuesday, ahead of the book's Sept. 11 release. In the book, Woodward confirms NBC News reporting from April that chief of staff John Kelly had called Trump an "idiot" and thought of himself as someone who was personally helping to save the U.S. from disaster.